I talked last week about our plans for finding balance. Yet plans are only wishful thinking unless you implement them. So, that's what we did this week. We've eaten at restaurants a few times without Amber having a fit about it. When we were talking about our lunches for co-op day she even said, "I prefer the lunch you make, but if there isn't time because I want my allergy shot before classes then take-out is fine." This is the balance and cooperation I need from her. I'm actually quite proud of how she's worked with me this week. In turn, I let her choose the restaurants and eat less food than I'd like to see if she also had a snack later in the evening at home. We've also decided to turn down the option Amber had to rejoin band this semester. She participated second semester last year, but this fall the band had trouble finding a home for practice and when it eventually had a spot the times didn't fit with Amber's schedule. Again this semester band is moving back to the location where Amber takes flute lessons and is at an unscheduled time. Yet, in our quest to make life easier on us all, we've decided to forgo that activity at this moment. I've also declined several fun field trips with our homeschool group. Normally we would have attempted most of them and had a couple of sick days afterwards. After a discussion, Amber and I decided to join only the field trips which are nearly guaranteed to be successful for Amber both during the event and on the following days. There are still several events in the next couple of months we have signed up to attend, lest anyone fear we are becoming hermits. We've also discovered, despite the midodrine, evenings are still not great for Amber. This Wednesday evening was supposed to be her confirmation test covering the most recent module: baptism. Fred and I decided it might be best to make other arrangement for the test. So instead Amber and I went up to church early Wednesday afternoon so she could take the test. It worked out well since Wednesday evening she kinda had a little crash. And while I was able to make dinner that night too since we weren't rushed on our way to confirmation, it did mean we lost school time during Amber's precious hours of clear thought. Adorable kitty cats. Rosetta with Amber waiting for lunch. Biscotti (aka Big Boy) avoiding proof he is cuddly. Two seconds earlier he was being a sweet cuddly kitty. Then bam... goofball. Finally, Milori chasing the "bug". Personally, I managed more workouts than last week while still being fewer than I wanted. At least I met my goal of less Diet Coke along with more fruits and juices. I also cooked dinner more times than expected. A few of those were pretty pathetic, but at least they weren't cheese and crackers. For our school lessons this week we had realistic plans that should have been do-able even with our known appointments, yet they were changed almost every day. The problems actually started Friday night into Saturday. I was prepping for Amber to begin creative writing so pulled out the curriculum we had used for a while last year. A brief review of the student book and I knew it was no longer suited to Amber. I asked Amber to look it over to which she responded that it looked too dry and "book like". Immediately I went searching for a new creative writing curriculum because we were supposed to be starting writing in a couple of days. Nothing like a last minute scramble when you think everything is ready. 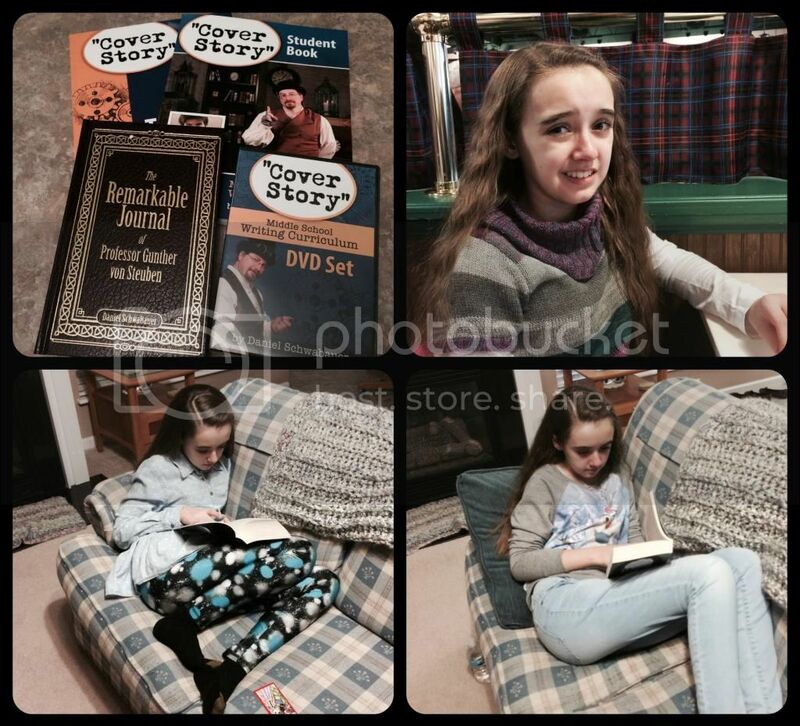 On Sunday I had Amber look at a couple of contenders and she chose Cover Story, which is the middle school level by the company that publishes One Year Adventure Novel. Thankfully, the shipping is quite speedy and it arrived Wednesday. Now, I'll spend the weekend familiarizing myself with another new curriculum for a Monday start. Instead of digging into writing this week, we began topic discussions for Amber's research report. I've decided to use only the Tapestry of Grace Writing Aids for the report instructions and rubric. (Much to my dismay, we've entirely dropped Writing With Skill. While we liked the curriculum, it is not something easily adapted to Amber's new learning style and schedule.) In planning I had decided the research report should be a science topic to encourage more science learning this semester. Amber wasn't interested in a science report and rather than argue over the topic I let her select the genre (see more cooperation here). She has chosen a broad topic of "castles" and is leaning toward a detailed subject of "life in a castle", but reserves the option of going with "castle structure and use". At least she chose a topic that has many readily available research resources. Our new writing curriculum. Amber having a teen moment at McAlister's and Amber in her favorite position this week. Fred took Amber to Barnes and Noble to use a Christmas gift card, so she's been very busy reading her new books this week. 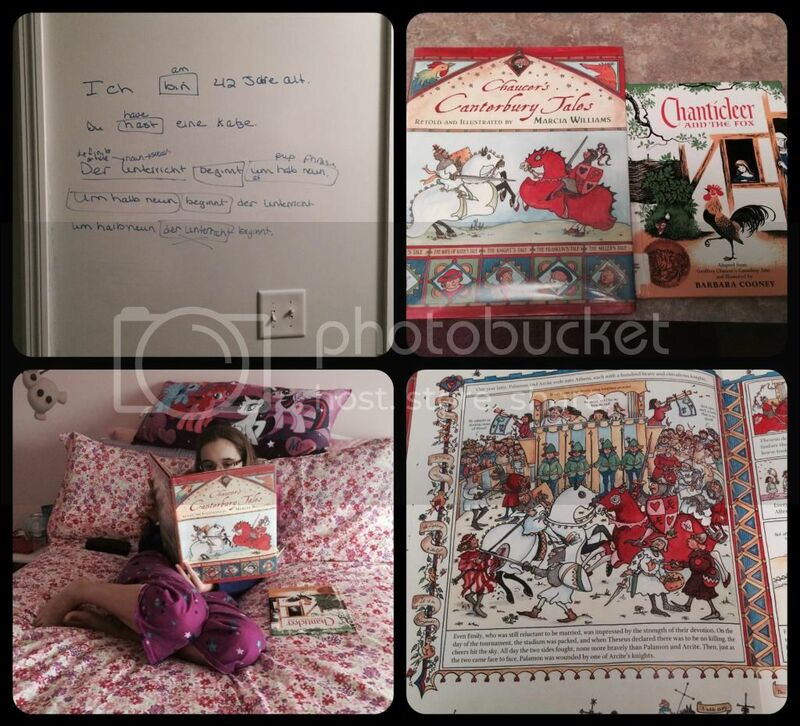 Amber dug into her literature this week by reading two very easy illustrated versions of the Canterbury Tales. They served as a lovely introduction and helped to acquaint Amber with her newest literature project. She especially enjoyed Chaucer's Canterbury Tales since it included both old English in the illustrations and modern English summaries on each page. We did not get as far into literature as I'd hoped this week, but it was a start. German made a triumphant return with completed three lessons, which is more than any other subject. At every turn the girl was asking to do another German lesson. I'm happy to see that she is interested in her foreign language subject. She actually is quite gifted in languages and catches on very quickly. Her sight reading ability is fabulous and I'm astounded each time I ask her to read aloud. She had actually fallen behind my co-op German class because they did not have nearly as long of a break as Amber had at Christmas. However she moves at a faster pace than the class, so I expect her to be caught up by Monday or Tuesday. Now that I've made it sound like a fantastically productive week, let me say all of this was accomplished in a very little amount of time. 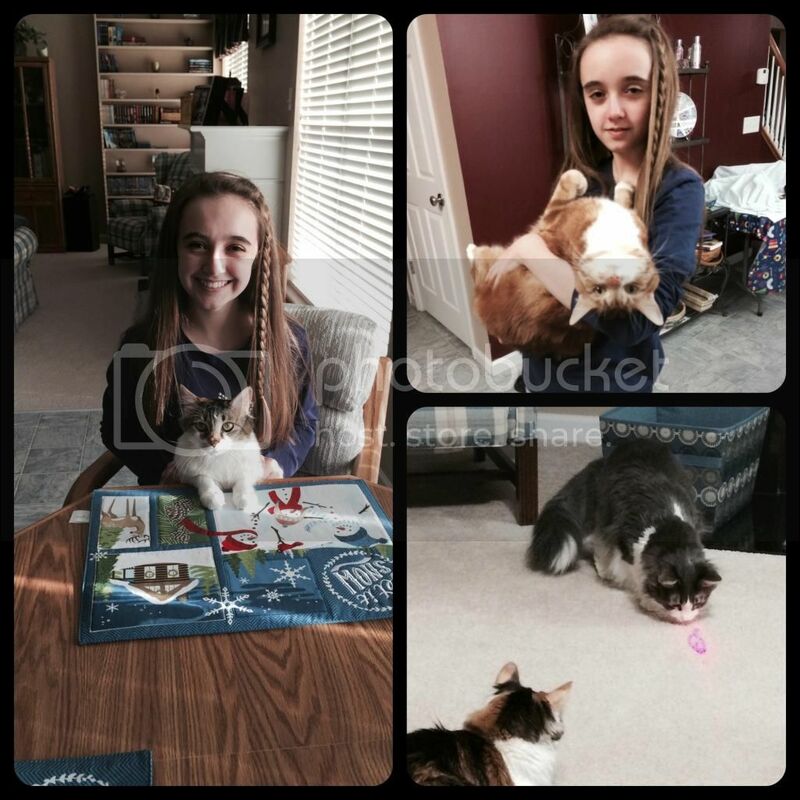 It was a positive start to the week completing much during the late morning and early afternoon on Monday before Amber's best friend came over for the afternoon and dinner. Tuesday was Amber's regular dental checkup, but she slept quite late that morning and accomplished no school at all before the dentist. Afterwards we met my mom for lunch, then Amber and I ran some absolutely necessary errands. By the time we made it home she was exhausted and only managed to sit on her bed and watch a couple of Khan Academy science videos. That was it; productivity stalled. Wednesday she actually got up at a decent time, but we had to eat lunch earlier than normal to be at church for the confirmation test. Then we came home for a little bit of history work before flute lesson. Amber is always tired after flute, but she pushed through the exhaustion to complete 4 subjects in the late afternoon. Thursday is our co-op day and no subjects are completed at home. That brings us to today. We went to a lovely symphony performance this morning; the tickets were part of Amber's subscription birthday present. On Christmas I gifted Amber with another year of once a month special days, and the rest of today is our January "Amber and Mom" day. Which means today will also not be a productive school day, however it will be a low stress bonding day for us. Today also marks the end of our gradual increase to full school days. We plan for Amber to be up on time regularly beginning Monday so that she can complete 4 to 5 hours of school a day plus her exercise. She has shown a very positive attitude toward school work this week and I am pleased with the progress we are making with her sleep schedule. I do have to say, this week has been tremendously less stressful knowing I don't have to do everything that fits into Amber's schedule. To tell people that an event just doesn't work for us at the moment is so liberating. I did volunteer to make Amber's costumes for the co-op drama play, and that's not an unsubstantial task. However, it is something I will enjoy doing and it will benefit Amber's drama class. These are the types of items I would like to have time to complete without feeling stressed because I committed to other events which do not bring us as much happiness. I am so glad you are standing up for your needs and finding balance. What a great week you all had. Balance is something I'm working on here as well. Learning to say no is one thing I struggle with but find myself doing more this year. :) Looks like a wonderful week and hope you have a relaxing wonderful weekend ahead. You really seem to be managing everything really well, and it is a great lesson for Amber to learn to compromise, especially as she sees you doing the same. She is blessed to have a mum like you!